Possibly one of the most interesting, lovely, and helpful people I have met during my cider travels has been the incomparable John Teiser, producer of Springherne Cider. John introduced me to Broome Farm and has helped in many ways to set me on the path of cider and perry. John is one of the true scholars of cider and perry, a man who goes searching through archival records of Bulmers farm plantings while also driving and walking through the countryside in search of old orchards and rare trees. 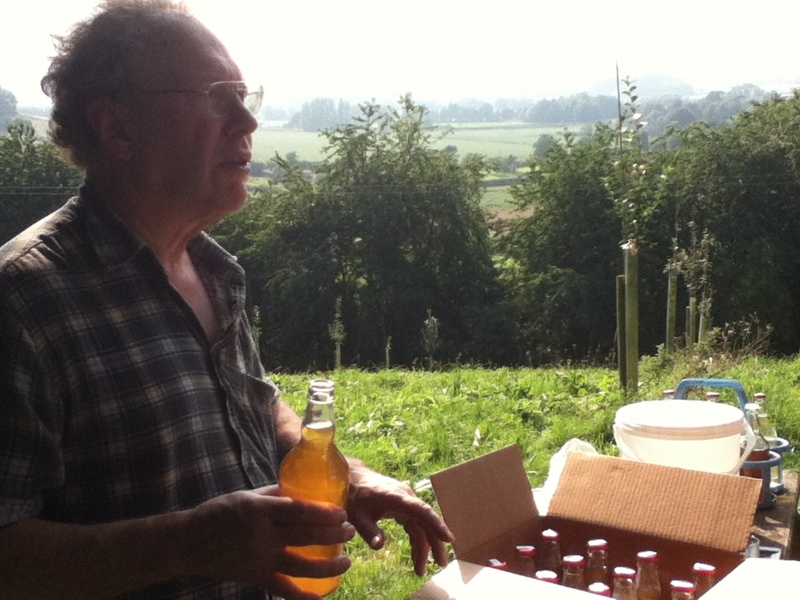 John is also, however, an amazing producer, not only for the quality of his ciders and perrys, but also because of his meticulous experimentation with rare fruit varieties. John invited me and Kate Garthwaite, another former Broome Farm apprentice who now produces her own Left Field Cider in British Columbia, Canada, accompanied by Mike and Phil from Broome Farm, to come over to his cider house on the side of hill overlooking the Wye Valley to taste some rare variety ciders. Most modern cider orchards produce vast quantities of a few varieties (Dabinette, Michelin) that have proven to be good annual producers (avoiding bi-annual variation of crops common to many apples), and which have disease resistance and good growth habits, as well as good cider qualities. However, there are many rarer varieties, which for various reasons didn’t make it into our current system of production. Often, these are found in old orchards, and even if no one can remember them anymore, they can be identified through a combination of comparison with documented variety characteristics and – if they exist – planting records from Bulmers contracts for orchards planted in their schemes. It’s a bit of cider detective work. John Teiser, however, has been using apples from a very interesting old orchard – one which was an early trial bush orchard in the 1930s for Bulmers. Here, bush tree cultivation was trialled on many varieties which never made it out into the agricultural system and some of which only survive now, in England, in this particular orchard. The ciders we sampled with John were made from some of these trees. The ciders were, for the most part, all bittersweets, and many were French varieties. Some of the highlights included the Collington Big Bitters, which Mike recalled as also being called the Mincemeat apple. The Damelot had a very light and floral fragrant taste. My personal favorite was the St. Laurent, which John tells us looks almost as dark as Guinness when it is pressed. Not only did this cider have the tannic qualities of a bittersweet, it also had a rich body, with a hint of nuttiness and butteriness. John also poured for us what he believes is the actual Hagloe Crab (a rare tree of disputed identity and provenance). Another fascinating taste experience was a Medaille D’Or, which was the most astringent tannic cider I have ever tasted. I couldn’t imagine drinking more than a sip. John handed it to us and said – this is one of the ones you wonder – why did anyone ever plant this? But John theorized that these very tannic French varieties might have been desirable to maintain tannin in the drink through the keeving process, which often precipitates much of the tannin along with the yeast, leaving a much sweeter drink. It was certainly an educational tasting moment, if not the most enjoyable one. (Stay tuned for a more accurate list of variety names – I forgot my notebook and was overcome by flavors and sunshine). Many thanks to John Teiser for a really amazing afternoon of tasting, blessed by the sun, and overlooking his young plantation of rare cider trees. May these rare varieties continue to be propagated, pressed, and poured into glasses for many years to come. 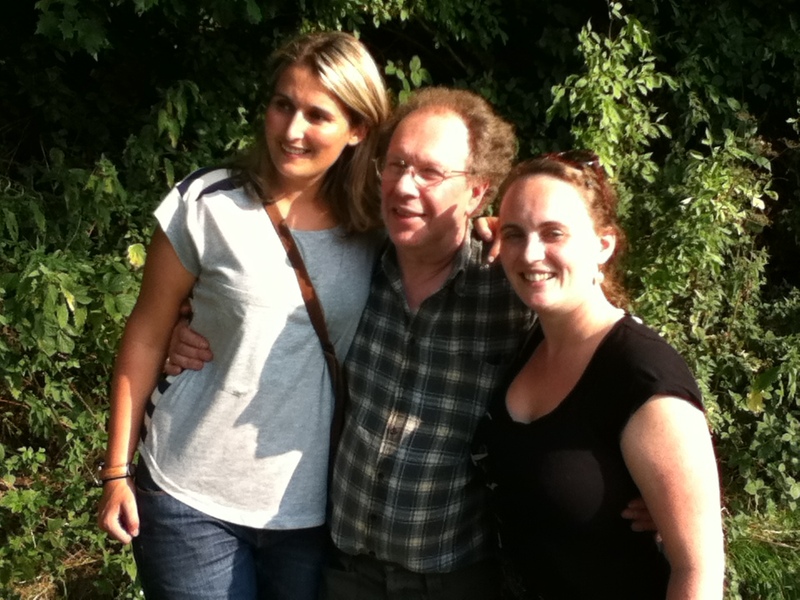 Thanks also to Mike for being our driver and Phil for….being Phil – always the best of company. This entry was posted in Apple Varieties, Orchards, Tasting, UK. Bookmark the permalink.